I love meeting first-time dog owners. They’re so enthusiastic about their pups — or their adult dogs, if they’ve adopted from a shelter. I want to do everything I can to make sure they get off on the right paw with their new pet. Because I talk to so many of them, I see some of the same mistakes over and over. They probably don’t seem like mistakes, especially to a new pet parent, but they sure can cause problems with a dog’s health and behavior in the long run. If you have just acquired a dog or know someone who has, here are five common mistakes new dog owners make and my doggy do-list for doin’ it right. Dogs need lots of handling throughout their lives. They’ll be visiting the veterinarian — at least I hope so! — and maybe seeing a groomer. They’ll meet kids, neighbors and strangers who may want to pet them — with permission, of course. They need to have their teeth brushed and their nails trimmed, and they will likely need to take pills or other types of medication. The best thing you can do to prepare your dog for all of this necessary attention is to get him used to having all parts of his body handled. He should be willing to let you touch him anywhere, including his paws and more private areas. This is an easy thing to practice every day. While he’s lying next to you or on your lap as you watch television, handle his paws, grasping them firmly but kindly. Look inside his ears or give them a sniff. Lift up his tail and check out his behind. Stroke his belly and give the groin area a going-over. Lift his lips and look at his teeth. You get the idea. This is also a way for you to learn what’s normal so you can monitor his body condition and catch problems early. Start brushing his teeth on day one. The earlier he’s accustomed to it, the more accepting he’ll be of it as a normal part of his life. Same with trimming his nails. Do one or two nails a day, just barely shaving off the edge. Be careful not to “quick” him. To get him used to taking medication, pinch off bits of Pill Pockets or cheese and give as treats. When he needs to have one with a pill tucked inside, he’ll usually accept it eagerly. Of course it’s important for puppies to grow, but we don’t want them to grow too much or too fast. That can put undue pressure on their still-forming musculoskeletal structure, which can lead to orthopedic problems later in life. Talk to your veterinarian about the best type of food for your dog. Growing large breeds can benefit from diets that permit slow but steady growth, while small dogs tend to need energy-dense foods. In either case, it’s important to measure your dog’s food and give it at specific times rather than free feeding (leaving food out all the time). This helps ensure that he doesn’t eat too much and become overweight. I tell people to throw out their dog’s food dish. Instead, exercise his brain and body by feeding him using a food puzzle or food-dispensing device. Measure out the appropriate amount of food, place it in the toy and watch him “hunt” for his meals by pushing or otherwise manipulating it to get the food out. This is a great way to keep him busy while you’re at work and to make sure he gets some physical activity and mental stimulation. 4. They don’t take house-training seriously. One of the most common reasons dogs are given up to shelters is for behavior problems — and one of those problems is pottying in the house. That’s heartbreaking because it’s such a simple problem to prevent. All it takes is scheduling, consistency, praise and rewards. Take your dog out at specific times: first thing after he wakes up, after every meal, after playtime and just before bedtime. During the day, set a timer to go off every two to four hours after the previous potty time to remind you to take him out again. Go out with him. If you don’t, he won’t know why he’s out there because you won’t be there to say “Good potty!” when he does his business. Then let him have a little playtime. He won’t want to pee and poop right away if all you’re going to do is drag him back inside once he’s done. When he’s in the house, prevent accidents. Don’t give a young or new dog the run of the house right away. Keep him where you can watch him. If you can’t watch him, put him in his cozy crate, exercise pen or small dog-proofed room (I like a laundry room or bathroom). As he gets older, he’ll be more physically able to hold his urine and stool for longer periods. He will also have learned that he gets to go out at specific times — and that outside is the place to go. You’ve probably heard that bathing a dog too frequently will dry out his skin. Not so! It actually can be good for him and for you. 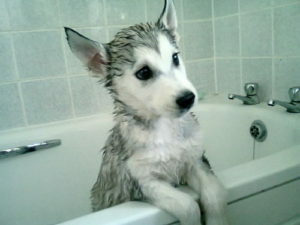 Weekly baths are good for your dog because they help remove allergens and infectious agents such as yeast and bacteria. They also help keep him clean so he’s more welcome in your home and on your furniture. Bathing your dog weekly is good for you because it helps remove allergens that can cause you to sneeze and sniffle when you’re in his presence. That makes him more huggable, and who doesn’t want that?